During our second week in Rio (Brazil), I received an email from my good friend Manish Jain, one of the founders of Shikshantar and Swaraj University, in Udaipur, India. Manish was writing to give me the name of Edgard Gouveia – someone we ‘really should try to connect with’ as he was doing some really exciting and inspiring work in Brazil. Following through on our principle of openness to what-arises-along-our-journey, I contacted Edgard right away and told him something of Enlivened Learning – what we were doing and why. 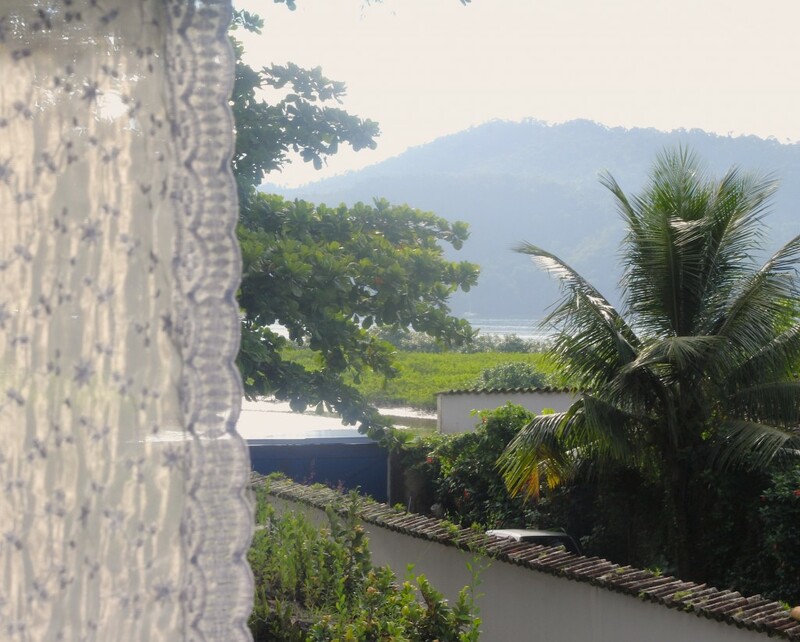 Edgard responded within a day and invited us for a visit with him at the small and magical coastal town of Paraty, located about mid-way between Rio and Sao Paulo. He was there co-creating and co-developing a game project – ‘Play the Call’ which he said he would tell us lots more about once we arrived… Udi saw that we could stop and visit Edgard on our way back to Rio after visiting the Landless Movement University, which was only an hour from Sao Paulo. We were a bit concerned about finding a place to stay, especially with costs. I emailed Edgard and asked for accommodation suggestions. His response came – ‘we are exercising gift economy as much as possible’ … plenty of space in exchange for us cooking a few meals! I first came across the ideas and language of ‘gift economy and gift culture’ when I visited Shikshantar: Rethinking Education and Development in Udaipur, India in 2008. Manish and his wife, Vidhi co-founded Shikshantar in 2000 as an open space for gathering together, co-learning and co-creating alternatives to mainstream ideas and practices of education and development (so-called progress). Aside from the many activities I engaged in while visiting Shikshantar, all of which included a generosity of time, creative spirit and skills, I spent hours delving through the deluge of donated books, magazines and other texts stacked on shelves that lined the walls. In particular, however, there was a stack of self-designed, ‘copy-left’ booklets on a range of topics that Shikshantar had self-published on a back table. One of them, Reclaiming the Gift Culture (edited by Manish and his sister, Shilpa) caught my eye. It became my first encounter with the language and ideas of gift culture, or gift economy, as it is often called. The Shikshantar booklets were available through contribution (whatever anyone feels moved to give). I donated a small amount of money at the time to take several of these publications home with me. I found them inspiring and engaging – I used several of these booklets and incorporated them into different classes I taught at the University of Bath. ………. Back to Brazil ………. 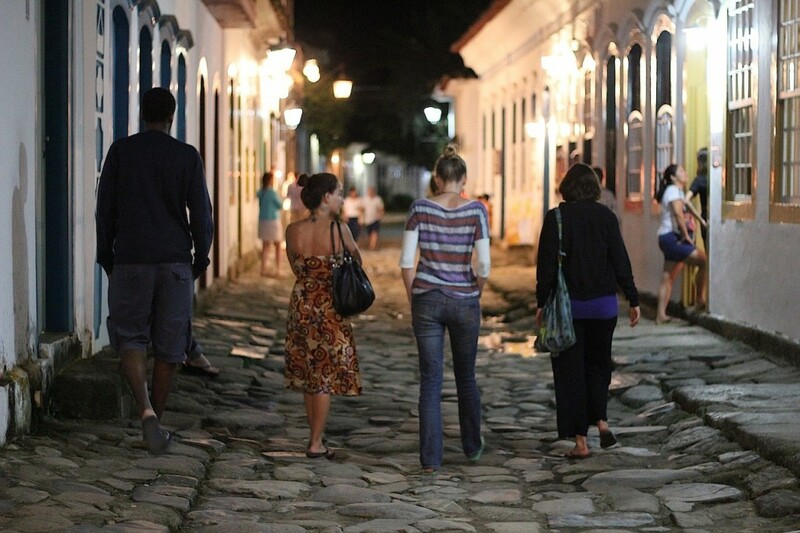 We arrived into Paraty after a day of bus travel from the Landless Movement University. We were without a phone and about 3 hours later than we had said we would arrive. All of us were tired, hungry and a little car/bus sick from the hours of travel. 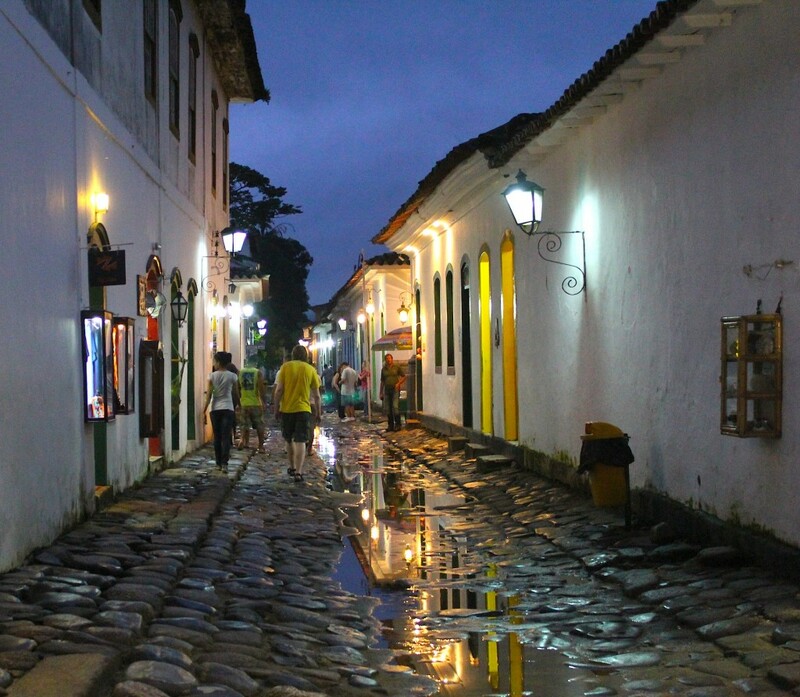 Paraty is a beautifully preserved Portuguese colonial town along the Costa Verde (Green Coast), a lush green section of coastline in the state of Rio de Janeiro, south of the city of Rio de Janeiro. 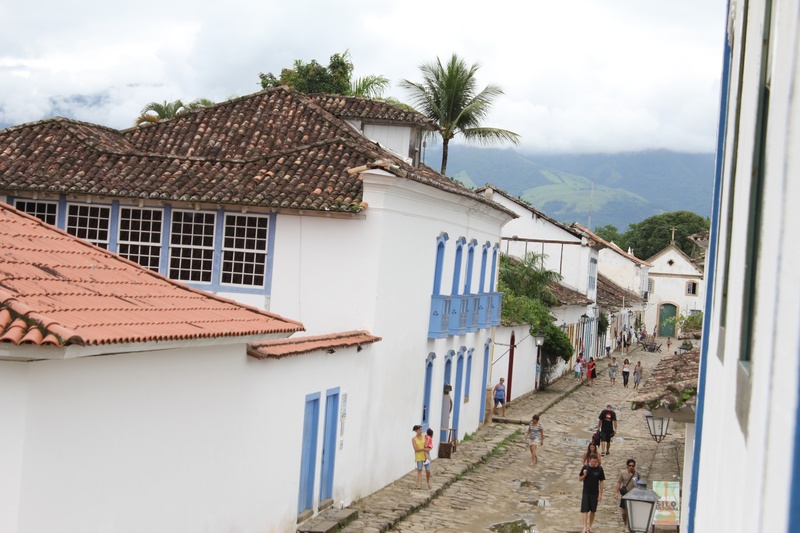 The town looks much like it did when it was settled during the Portuguese colonial days – the buildings are all refurbished, left over from the colonial era, the majority of the streets have not been paved and have unique forms of large cobblestone. It had been raining when we arrived and some of the streets were nearly flooded. 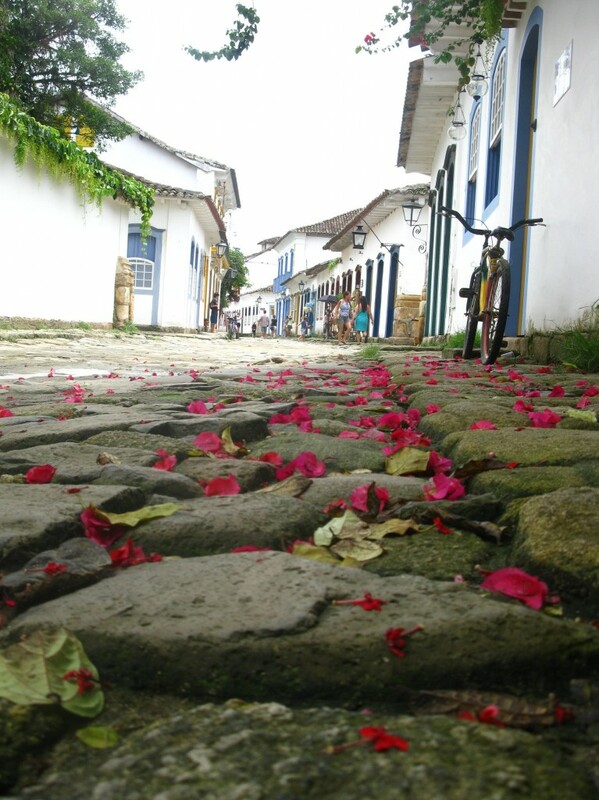 The pedestrian-only streets of Paraty consisted of large stones where we had to either hop or take large steps between them, because of the rain. Not such an easy mode of transport carrying heavy bags and feeling tired and sluggish. However, we all felt a burst of new energy as we walked/hopped deeper into the town in search of the house with the address where Edgard was staying. We finally found the address at a huge corner house, one block from the sea. We rang the doorbell and no one answered. Suddenly around the corner came three people. We heard a loud, booming voice, ‘Kelly? Udi?’ Edgard was suddenly there with two other friends. He enveloped each of us into a big hug (quite easy for him to do as he is 2 metres tall!) and ushered us into the house. We entered into an exquisitely beautiful house that looked as if it could still be the 1800s. 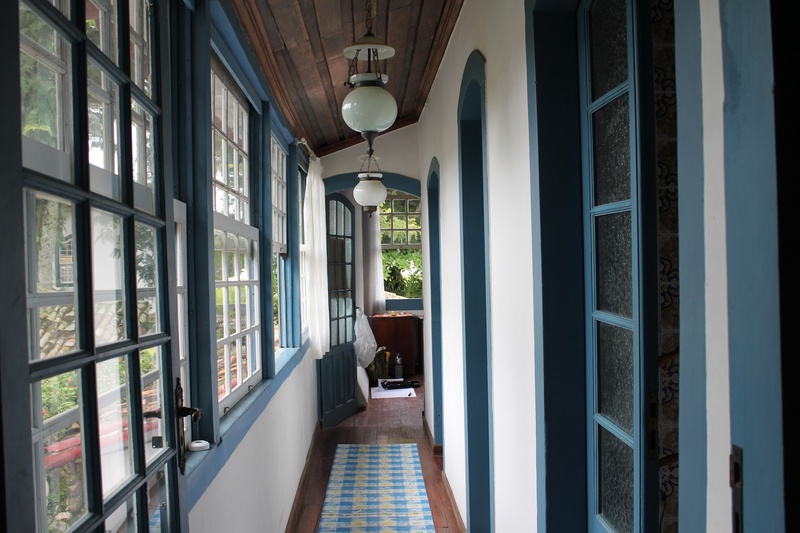 The floors were dark wood, high ceilings and lots of windows. The walls were adorned with signs and posters from what I was assuming were drawn by the different people that had been joining Edgard to co-create the game project. We all sat down in the huge main room and a long conversation ensued. The friends that were with him – Chris was leaving the next morning and was just passing through town as Udi, Marina and I were. The other friend, a lovely woman called Adrienne, had been there several months offering her time and creativity on their game project, ‘Play the Call’. The intent of the game is to involve young people to engage more directly in making change within their community. It had evolved as an online, virtual game that is carried out in real life. Young people over the age of 8 are given a series of ‘missions’ to plan and carry out, each one more challenging than the previous. In order to move to the next mission, each player also had to engage with others about what they are doing and why, take a few photos to exchange the story of how they had accomplished each mission – and have it ‘liked’ by many on facebook, before moving on to the next mission. The entire project had been completed almost entirely without monetary exchange. The aim was for the game to be entirely accessible, for anyone and without any barrier-of-entry due to some financial requirement. The idea was that the planning, creating and establishment of the game should be completed in the same way. In other words, all stages of ‘Play the Call’ (from its conception to its full functionality) were to become part of a gift economy and culture. Edgard had been experimenting with various possibilities of a gift economy to not only provide access to the game, but to set it up as well. Edgard made the point that if you are clear in what you want and open to asking and giving (through acts of reciprocity) things open up, often beyond what you think is possible. 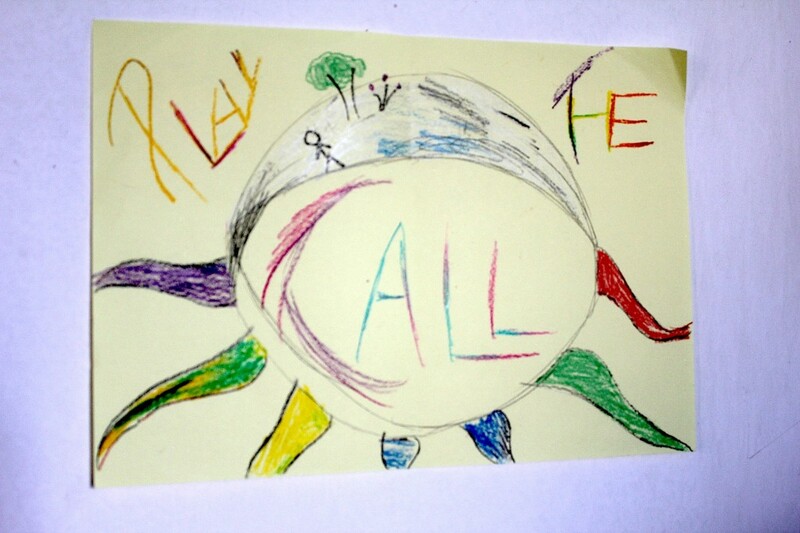 The idea of ‘Play the Call’ aspired to contribute to a more peaceful and just society. But, to get things rolling, Edgard needed a place to stay, to host other people, access to food, technical expertise and people who could help co-create the specificities of the game. Most of us are completely dependent on money to ‘do the things we want to do’. I hear this statement all the time. If ONLY I had the money, I could…. I would… Again and again – before embarking on this journey, and during this journey, we have met many people who stopped projects because of the lack of financial resources ‘it just became impossible because we did not have enough resources’. Yet, many, many others along our journey have used their lack of financial resources as a welcome opportunity to imagine alternative forms of resources to be more creative and further enhance what it is that they want to do – to reach out – building communities and learning (and exchanging) time, creativity, energy, hospitality, new skills in the process. At the base of this, it has seemed to me is a willingness, a confidence and a courage to re-define what is meant by ‘resources’ and to see the abundance of what is around you, immediately available (if you can see it in this way), rather than seeing most of the world through a perspective of scarcity. 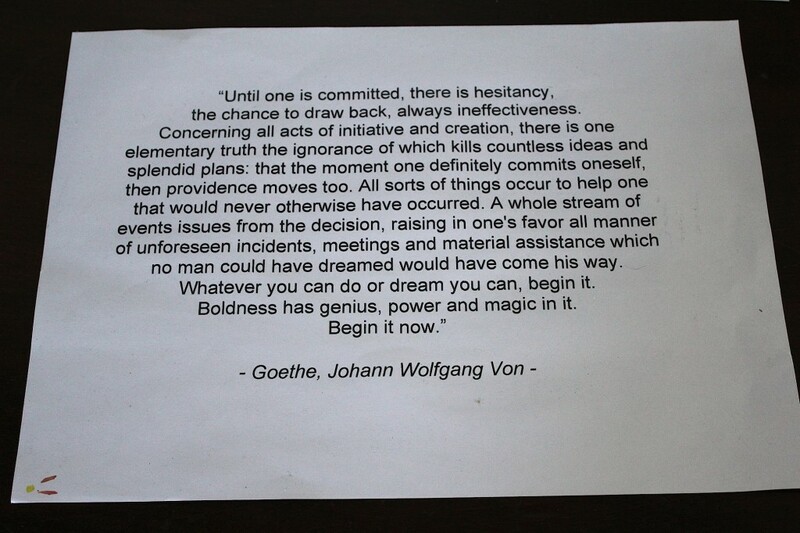 Udi and I have been trying to do this as well – where we can. Coming from research backgrounds where institutional money is spent much more freely (e.g. – hotels, restaurants, taxis) during time spent in the field conducting research, we have been unlearning on this journey — by being committed to engaging in gift economy practices as much as we can. Although there are obvious costs associated with flight travel that are difficult to negotiate (especially long flights between countries), we have been taking many long (15+ hour) bus rides, staying in homestays and with friends– as well as couchsurfing (rather than staying in hotels). We have also been offering our skills with filmmaking and photography from a ‘copy-left’ (what is mine, is yours) perspective when we can. Edgard had been searching for a place in which he could host people to help create and support all aspects of ‘Play the Call’. A friend of his let him live in a house of theirs for 4 months, for free – a house that accommodated many people at the same time. To feed himself and the people who came to help, Edgard reached out to local restaurants and food businesses and asked that they donate meals during the months they were creating and finishing the game. For the technological expertise needed to create and complete the game, Edgard invited people he knew – to then reach to more people that they knew – to locate interested and technologically skilled people to come and give their time and energy. All of these steps of reaching out worked. Gifts of accommodation, food, skills and creative energy were exchanged in this way through reciprocity. The abundance that is there, literally right at Edgard’s doorstep – was not out of reach. It just had to be located and asked for. The reason it worked? Edgard’s humility, energy, commitment and passion for what ‘Play the Call’ could be … would be … once completed. Not just for the young people participating, but for their communities – and as a huge network of individuals and communities across the globe. As Edgard explained – ‘who can say no to the earnest and innocent energy and courage of children? 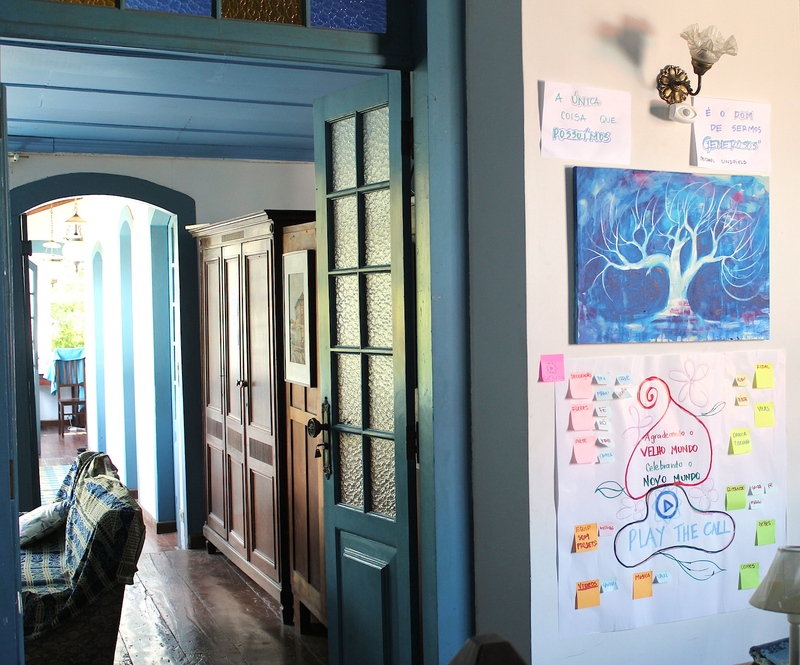 — as adults, we are far more likely to listen to the views of children than other adults’ This was a fledgling, but very much living gift economy that Edgard helped to setup in the local community of Paraty around his project. These gifts were actually alive – providing sustenance, energy… as Lewis Hyde describes the ideal of a gift in his wonderful book ‘The Gift’. … and as Edgard taught Udi, Marina and me, a gift economy increases the livingness, the value of the gift by creating community and bringing forth abundance where it might not have been seen or experienced previously. Typical to gift economy or gift culture, there was the avoidance of the interaction of money or consumer good as the center point of the exchange. Gifts exchanged within a gift culture or economy, are centered on relationships between those exchanging gifts (which again Lewis Hyde beautifully describes in his book). 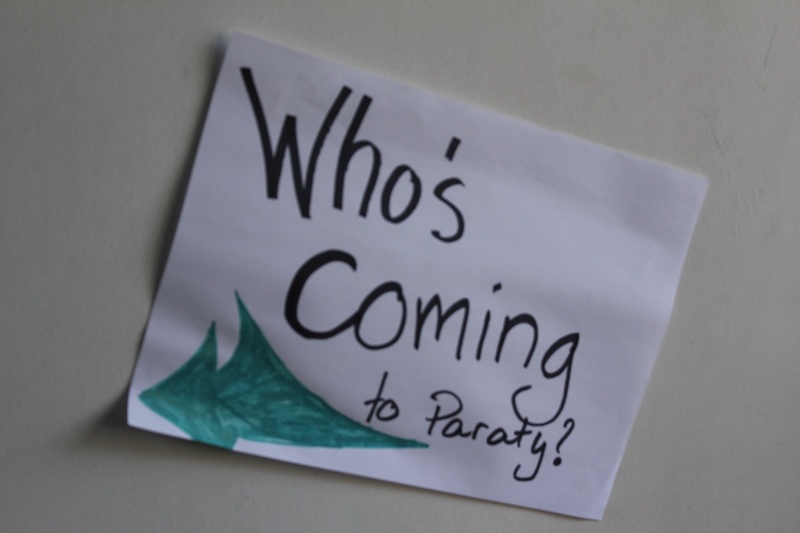 Imagine if learning communities that emerged from gift culture were commonplace. Imagine if our learning was to imagine, create and experiment with different forms of gift culture and reciprocity. How much richer could our worlds be? There are communities all over the world that are experimenting with different forms of gift economy – places like Universidad de la Tierra (University of the Earth in Oaxaca, Mexico), Swaraj University (that emerged from Shikshantar in Udaipur, India), transition towns creating local currencies and time banks, home-schooling communities tapping into the wealth of local knowledge and skills that are within walking distance of their homes… In various forms, each of these places are experimenting with gift culture and economy. Last October, Manish and many others organized a ‘Giftival’ in Istanbul, Turkey followed by another Giftival held in Kerala (India). See this link for a detailed blog posting about the Giftival event in Turkey. I hope to write much more about our continued learning and encounters with gift economy and gift culture as our journey continued… Edgard taught us about the possibilities of taking a brilliant idea and creating a living project and community — by finding the abundance that is right around you and engaging in a reciprocal gift economy. We did cook those few days with Edgard — and he gave us the invaluable gifts of courage, wisdom, hospitality and friendship, to inspire us to notice the abundance around us – and to spread that awareness and inspiration with others…. Simply stated. Yet, is it simple? Hardly.It is stated as a fact, something that is. But how is this understood as a fact? 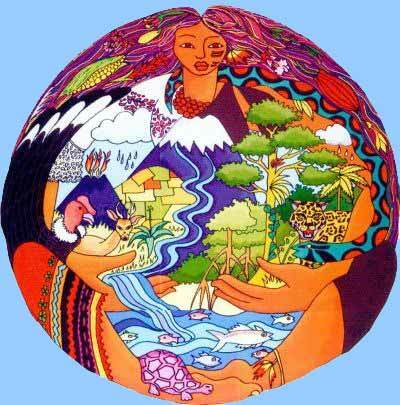 How is education approached as environmental education? Or perhaps more significantly, how is it not? Many times along this journey, I have been lost in my thoughts considering these questions – turning them around, stretching my mind (and heart) to answer these in different ways. I am continually amazed by the ingenuity and courage I keep encountering within the places of learning that we are visiting as to how groups of individuals have put their creative and inspiring thoughts into transformative action – to bring these two (‘education’ and ‘environment’) supposedly separate entities, into one intertwined being. Because I have been thinking about environmental education for such a long time (through my studies but also through teaching and activism work that I have done), the forms of education and learning that we keep encountering on this journey continue to challenge my understanding of not just what ‘environmental education’ is, but equally what ‘education’ is and can be, and, where ‘the environment’ actually is. My initial idea of what constitutes the ‘environment’, was very much the non-human environment. Before I had ever thought very deeply about it, ‘the environment’ for me could be found in its ‘pure’ form where it was that human beings were not. I was trapped in the dualistic world within which the vast majority of us live and learn. Dualistic in the sense that nature and the environment were just down the road, out of town, separated from the rest of us human folk. What I have come to learn through all of these 20+ years since I left home, is that the root of the multiple problems and crises we all face, are directly related to this perceived separation between ‘me’ the human and ‘the environment’ and ‘nature’. This might be quite a serious jump to make, in fact such a leap that it might seem preposterous and somehow archaic, but I keep ending up facing this conclusion. And, this journey has escorted me to that edge within every place of learning we have visited. 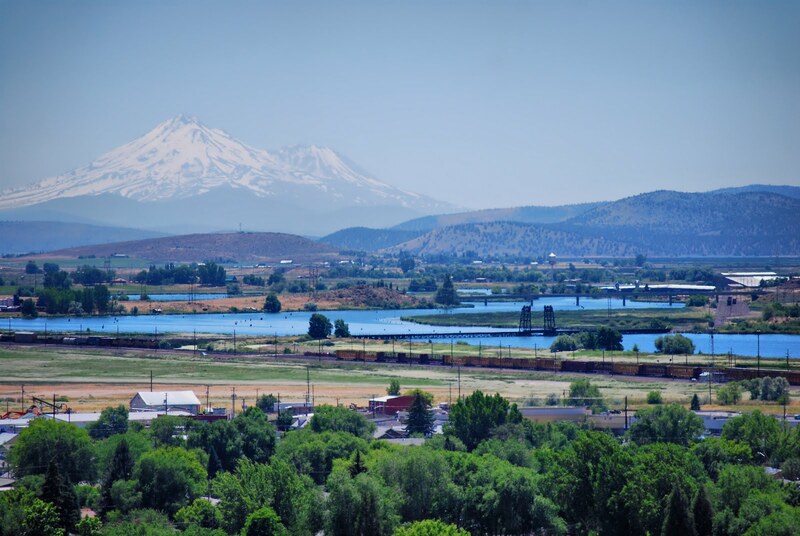 I grew up on the edge of a small town in southern Oregon called Klamath Falls. The closest store to my house was 5 miles away. If I walked up the large hill behind the house, I could continue walking for 20 miles or so in undeveloped wilderness. Taken from the center of Klamath Falls, Oregon, showing Mount Shasta in the background (Mt. Shasta is 60 miles to the south). To the east was the vast Cascade Mountain range that runs all the way from southern British Columbia down to Northern California. Growing up just west of this majestic mountain range, I could see the high and snowy peaks of Mt. Shasta and Mt. McLoughlin from town and I was just 45 minutes south of the richest blue imaginable, emanating from Crater Lake, the 7th deepest lake in the world. This was nature, the environment at its best. It was an environment for me to visit, learn from, engage with and be inspired by. To many of the people living in Klamath Falls, these natural places (excluding Crater Lake as that is a preserved National Park) were seen as an environment to manage – to cut down, dam up, extract from – through which to earn profit. In fact, the profit motive for natural resources, particularly timber that surrounds this town goes beyond individual and family accumulation – fuelling the very public and government services of the region. Revenue from timber receipts have historically funded up to a third of the county’s educational budget. During one of the years that I was in high school, when timber felling and harvesting became increasingly restricted due to environmentally-related policy constrictions, programs were cut, including the bus service through which the majority of students were transported to the school. The rural nature of the location of my high school then came into full fruition — several students rode their horses to school! In spite of the various economic and recreational ties to the environmental and natural abundance surrounding this area – this nature, this environment, was not quite part of me, or else I did not (and perhaps could not) see or experience it as such. 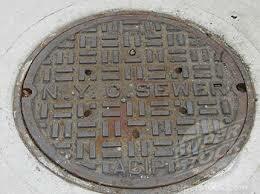 Then I decided to study Environmental Studies during my under-graduate years – on the other side of the United States. 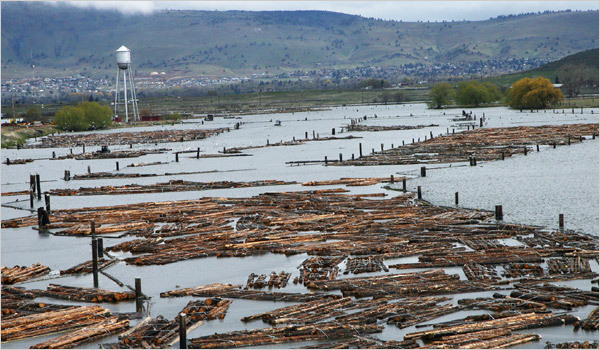 So economically sensitive is Klamath Falls to ‘conservation of the natural environment’ that I often avoided to fully explain to friends and others what I was studying when I would return home. I discussed all that I was learning in history, philosophy, sociology, science…. avoiding the centrality of ‘environment’ within these various disciplinary perspectives. The wonderful thing for me at that time, was that I was learning through all of these perspectives – although they were centred on ways of understanding, managing, stewarding and valuing ‘the environment’. Though largely intellectualized, it was my initial entry into multiple worlds. I began to perceive the area I grew up differently – I was more critical, more nuanced – and felt a deeper intrinsic value for these beautiful and awe-inspiring places. I was thrilled at the various thought-provoking doors that kept opening. I was (finally) in an educative learning space that enabled me to consider the environment. Yet, I was still perceiving through a separated lens – a lens that separated me from this land, particularly in that I was learning about all of this from such a geographical distance. It was, however, the first time thoughts about how to teach and learn about the environment crossed my threshold of consciousness. I was not studying ‘environmental education’ but I was in an educative space learning about the environment – about the varied interests and coinciding philosophies underpinning these interests. From there, my path was put on a slight hold for a couple of years as I dallied in the corporate world as a paralegal and then as a waitress in New York City looking for work. I ended up having a primary school teaching position (located in the Bronx) fall into my lap and from that point, it seems, there was no turning back. I have been either working in or studying some aspect of education and learning ever since. Teaching year 6 is great because you teach all subjects to the same children. For 2 years I had the responsibility of teaching 25+ 11-12 year olds math, social studies, reading, science, spelling, health and religion. The best part was that I could combine these into inter-disciplinary projects. I did this very often. It made learning and teaching much more fun – for the students and for me. I also incorporated quite a lot of environmental ‘knowledge’ and ‘experiences’ into it. I felt there was a need to bring these students out of the intense (and often hostile) urban environment they were living in, to learn about different plants, biomes around the globe, environmental issues such as deforestation and water pollution – and to experience being outdoors in beautiful open places. In addition, I became acutely aware of the perversity of environmental and social injustices experienced in the day to day life of my students living in an area of the South Bronx where enormous quantities of waste is held and incinerated (more than 80% of my students each year had asthma which is directly linked to incineration smoke). Simultaneously, during the second year of teaching, I enrolled into a Masters program at New York University called ‘Environmental Conservation Education’. 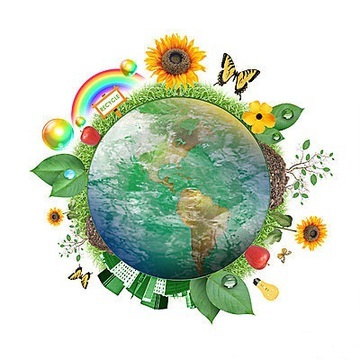 During those years of study, I took several Environmental Philosophy courses which opened my mind to new world views of the ways in which we as humans relate to the environment, what in fact the ‘environment’ is and how our perceptions of it can have profound effects on how we treat the world around us, including each other. I also took courses in Environmental Health, Environmental Justice, Botany and Environmental Journalism. Although I had explored some of this in my undergraduate years, this took it a step further, opening up yet more pathways to engaging with the complexity of inter-disciplinary and systemic issues – particularly how they related to education and communication. 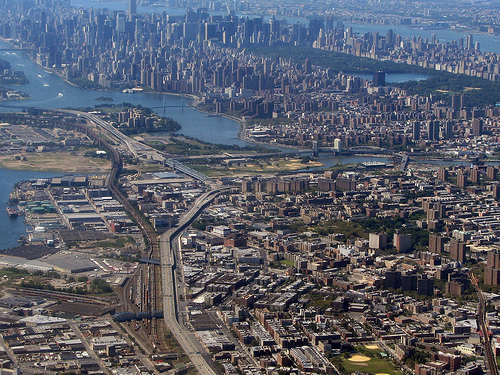 I then worked as an environmental educator for an environmental non-profit organization in NYC, working with secondary schools across the city, teaching in various science and social studies-related classes and designing semester-long projects with different students and teachers. These projects brought everyone outside, engaging with not only the non-human environment of NYC, but also learning about the treatment of sewage (I think I visited all of the sewage treatment plants in NYC), the transfer of the city’s water, the health of the river and creek systems. We became more politically active – doing tabling events, holding seminars, inviting local politicians and media sources – and speaking with local businesses. 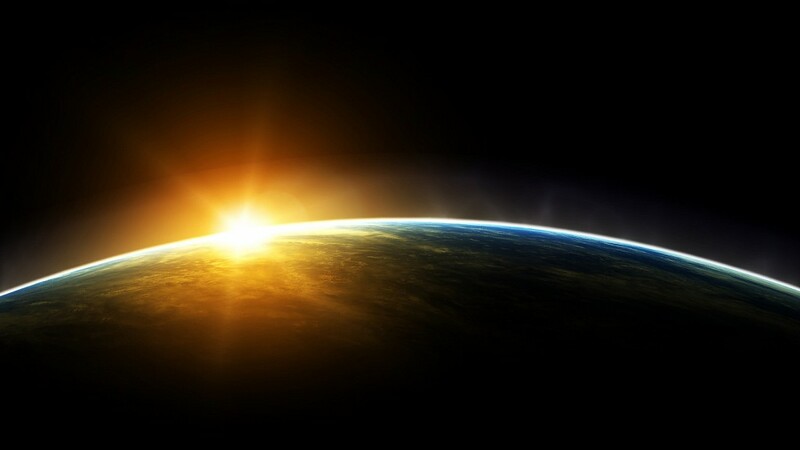 During all of this time, my engagement with the world, human and non-human expanded. I began to see myself more and more embedded within the environment in which I was living my day-to-day life. Yet, I still struggled to merge these worlds together in my work. It was not learning that I had experienced through my university studies – rather it was learning I was developing independently through a non-profit framework. And, it was still somehow a ‘special’ and ‘extra-curricular’ activity to get students and teachers outside of the school building to learn first-hand about various aspects of the world outside and about how their basic needs were met (i.e. sewage, waste, water and food) and how this connected to where they lived. What I discovered with those students, was the all of us felt more alive, more connected during the hours that we explored and learned outside the walls of the classroom. We were all somehow more ‘home’ during that time. Over the next 13 years, as I entrenched myself further and further into the academic/university world in the UK (after leaving NYC), I felt an increasing alienation from any sense of ‘home’. This was not just because I was living even further away from southern Oregon by staying in England. It was because I felt myself becoming more and more of a slave to the expectations of what it meant to stay working in academia. Which, is essentially to be disconnected and disengaged – from the local surroundings, from the passions that drove me to work in academia in the first place, from the people I was working and learning with – basically, from myself. 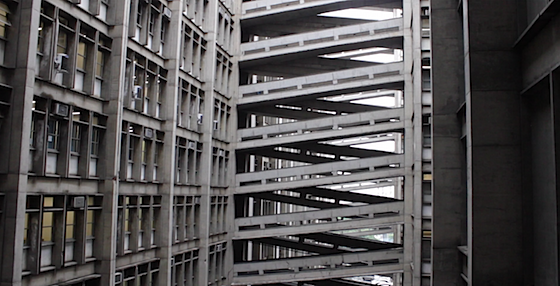 Photo taken by Udi in Rio de Janeiro at one of the public universities (January 2013). The vast majority of universities have been imposed onto the land on which they exist ( in other words, they did not arise from that particular local context). They are environmentally-orientated in that they exist on the land. Yet, for the most part, the learning is completely dis-engaged and detached from the environment, from that local context. Learning is about making your brain bigger – as well as your hands (to type) and your bum (to sit for longer periods of time). It is not about enhancing your heart (emotions) and the rest of your body for learning – moving, making and creating. The purpose of the university these days is fundamentally about contributing to the global knowledge economy – that which is measurable and therefore profitable. This core purpose is now universal. The connection is about economic growth, disconnecting us for what makes us most human. The concept of ‘localization’ is just a mere concept that might be encountered, but beyond that, there is no practice of localized learning and action as such. I yearned for connection – to my deepest self that makes me a human being, to learn and grow from that perspective, rather than contribute to the growth of the knowledge economy. So, I finally made the move. I found the courage to step out, to exit and move forward, to learn to let go of that alienation which had rooted itself into my soul and to go down the path of re-connection and unlearning on this Enlivened Learning journey. As time has passed, moving around as much as we have (we have not unpacked in months), I feel in many ways ‘back home’ regardless of where we are visiting. Perhaps this ‘back home’ sense is because our intention is to connect – within ourselves to where we are – and also because we are simultaneously learning about how others are so creatively connecting themselves through the learning they are doing as part of these higher education initiatives. All of these places of learning that we are visiting, are emerging from the context they are in. They are organic, deeply rooted and connected intimately to the cultural, ecological and historical past and present within which they are a part. Symbol for Enlivened Learning designed by Udi, 2012. It is relatively easy to see each of these places as environmental education, environmental learning – or even better, learning that is embedded in the environment. And this is evident in a myriad of ways. Learning is essentially about connecting to who we are as human beings – separately yes (in terms of connecting with your ‘inner’ self), but most importantly, how we are connected to each other and to all aspects of the world around us. The environment comprises everything – it is not just ‘extra-curricular’. For example, in Alberta, Canada with the Blackfoot, we learned about the simplicity and profound impact of committing time to a specific place, to learn the land or through a better explanation that Ryan and Adrienne described, to ‘let the land learn you’. 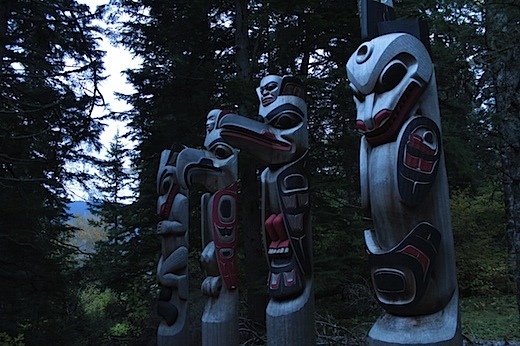 In Terrace, British Columbia, with the First Nations carvers at the Freda Diesing Northwest Coast Art School, we learned about the stories, symbols that have been documented through carving as forms of literacy that are intimately inspired by, and connected to non-human beings and relationships existing all around. As outsiders, we might refer to this as ‘art’ whilst for thousands of years, carving was, in fact, localized forms of literacy. Totems in Kitselas canyon, British Columbia, taken by Udi when we visited the Freda Diesing Northwest School of Art, October 2012. At Unitierra, in Oaxaca, Mexico, we learned about the fluidity of learning needs and desires coming together through groups of individuals working as a community — committed to collective autonomy centred on food, water, shelter, waste, communication and festival. With PRATEC in Peru, we learned about Quechua indigenous forms of agricultural practice that are inseparable from their spiritual cosmology which animates relationships with all non-human beings. In Brazil, with ESPOCC, the School of Critical Media, we learned about how people living in favelas, or shantytowns, are taking control of their own image and identity – by becoming more deeply acquainted with their local cultural, social and ecological surroundings and portraying these to the local and outside worlds through various forms of media – of their choice and through their authority (rather than it coming from the outside). Also in Brazil, we visited the Landless Movement University that brings together individuals and communities living within Landless Movement camps (that were settled to occupy and use unoccupied land) or belonging to kindred social movements or organizations engaging with issues of social and ecological justice. All of these places of learning we have visited so far – and the myriad of places we are visiting post-Brazil all offer an incredible richness of opportunities to learn about different forms of education and learning. Education is inseparable from context – completely embedded within all aspects of ‘the environment’. It is not just learning about the environment or for the environment. They are one and the same. There is no separation. Whatever is needed and decided to be learned about is directly connected to the world around that particular learning space. 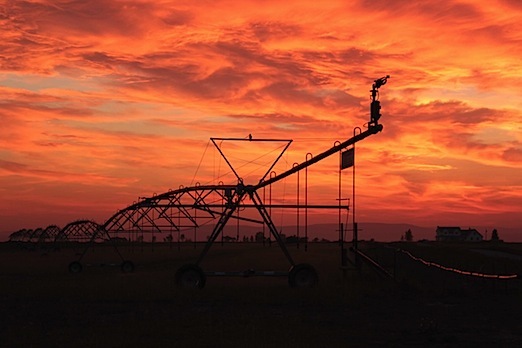 Sunset just outside of Fort MacLeod, Alberta, Canada, taken by Udi September 2012. To me, these inspiring places of learning mirror the true purpose of education – to be fully realized through and within all that we are a part of – ‘the environment’. For the most part, conventional schooling at all levels, helps us learn how to be further apart from the natural world. To me, this deprives us of the capacity and potential to live as more fully responsible, ethical, passionate, disciplined, generous and loving human beings. If we are to become more fully human as the Blackfoot are trying to teach at Red Crow Community College – we must learn to adapt ourselves to our environments as indigenous people have done for thousands of years – to learn through reciprocity – rather than the other way around – through this sense of detachment. 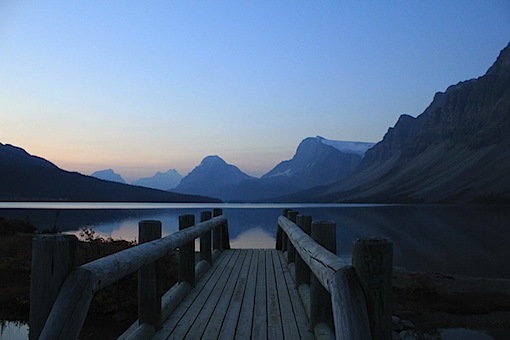 Bow Lake, Alberta, Canada (inside Banff National Park), taken by Kelly, October 2012. Our journey has met, experienced and reflected on different forms of de-institutionalisation and de-professionalism, with other ways of practicing teaching and learning. Now we are experimenting with how this might apply to obtaining resources, through a gift economy, for learning, writing and filmmaking and communicating. We are launching a crowd-funding campaign on indiegogo to raise funds to finish the documentary we have been making along our journey. We have also added some perks such as high resolution downloads of the film and extra features when we have finished the documentary, photographic prints from a selection of our best photos in this journey and a silk screen print made by the team. We passionately believe in the importance of this project and up to this point, have funded ourselves. However, to complete the documentary we need a further $25,000 – for remaining travel expenses and basic living expenses during editing for our team. 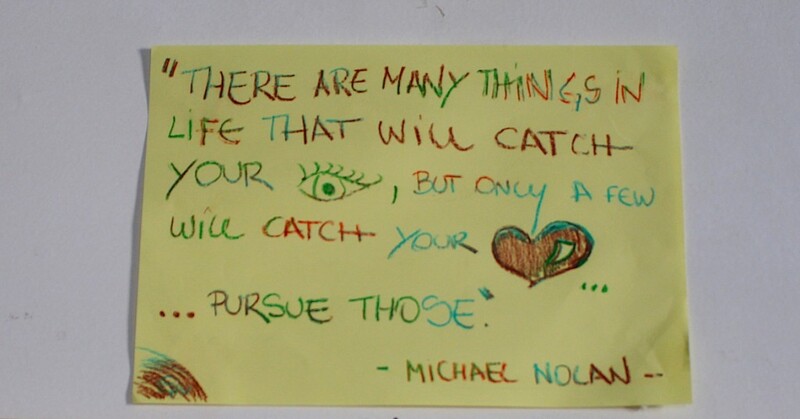 We have 6 months left of our journey and will visit more inspiring initiatives and people in India, Europe and the US. To do this we need to cover costs related to travel and expenses. Once we have completed shooting, we will need at least 5 months to edit over 100 hours of material (spoken in English, Spanish, Portuguese and Hindi). In this period we will be working with another editor, a post-production designer, a sound mixer, composer and a web designer. We will also be working with a team of transcribers and translators in the initial languages stated above. All of this requires funding to at least cover travel and basic living expenses of the team which we have budgeted at $25,000. All these people, including ourselves, are gifting their time (in other words, not receiving a salary) as we all believe in the purpose of the project. Our intention is to encourage accessible and critical debate on education around the world and open up imaginative possibilities of what learning can be. Any funds contributed will be supporting us in this process. We are also taking this crowdfunding experience as another aspect of the journey, of how to engage with resources and money in a more creative way. We hope we reach our target of raising $25,000 in 40 days, which we have budgeted is what we and the whole team would need to finish the documentary by next May and make available for free online on a new specially created website. But whatever happens we have been learning a lot in the process! I am sure we will have much more to write about regarding this. The film Enlivened Learning will be distributed (freely or by donation) online through a project website and we also plan to screen the film across a number of international locations and festivals. We will translate the film into English, Spanish, Portuguese, Hindi and other languages, depending on request. Our intention is to encourage accessible and critical debate on education around the world and open up imaginative possibilities of what learning can be. Any funds we gain through indiegogo will be supporting us and the rest of the team in this process. We are very keen to have people joining this inter-cultural conversation on what kind of education we, our communities and our planet needs. We understand if financial contribution is not possible at this time. You can help us to get the message out about this film and check out our website and get in touch with us if you want to help out in any way. We are always happy to meet more kindred and creative folk. We’d love to hear from you! The day after Christmas, somewhat reluctantly, we climbed on to a bus bound from Cusco to Puerto Maldonado, in Peru. We had spent just over a week in Cusco, staying with a friend of Udi’s who has been living in Cusco for a decade. Originally from Ireland, Ev is now running her own (fantastic) clothing design shop called Hilo (thread in Spanish). Her clothing is quirky, unique and elegant. I am a huge fan – if you ever go to Cusco, do check it out! 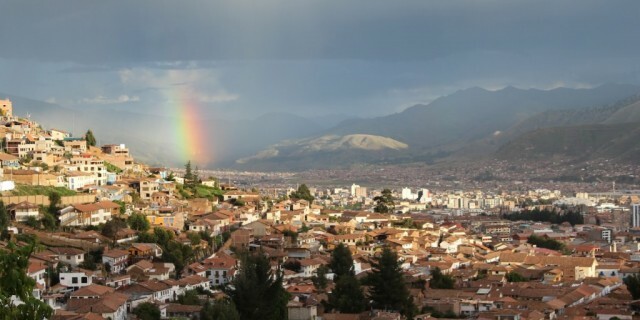 She lives high up on a hill overlooking Cusco. Needless to say, the view is sublime. Alongside Ev’s generosity and several Christmas celebrations she invited us to, our time in Cusco was vibrant, uplifting and very full. 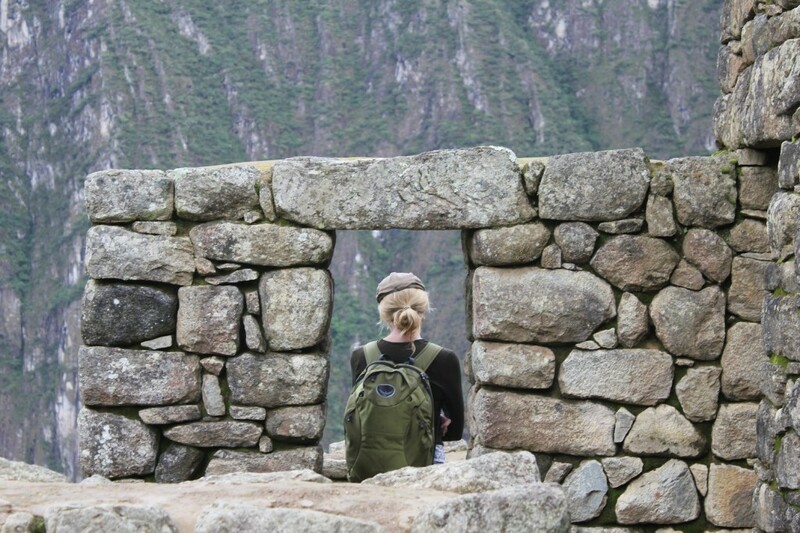 From connecting with old friends, meeting new friends, being introduced to Pratec’s CEPROSI through Elena, participating in a powerful Quechua ceremony (see previous post – Learning in a Quechua Ceremony) and climbing on the sacred Inca stones of Saqsaywaman, Ollantaytambo and Machu Pichhu, we felt disheartened to leave yet another beautiful place we were beginning to felt deeply connected to. It is hard to continue being open along this journey, especially when it is time to move on. 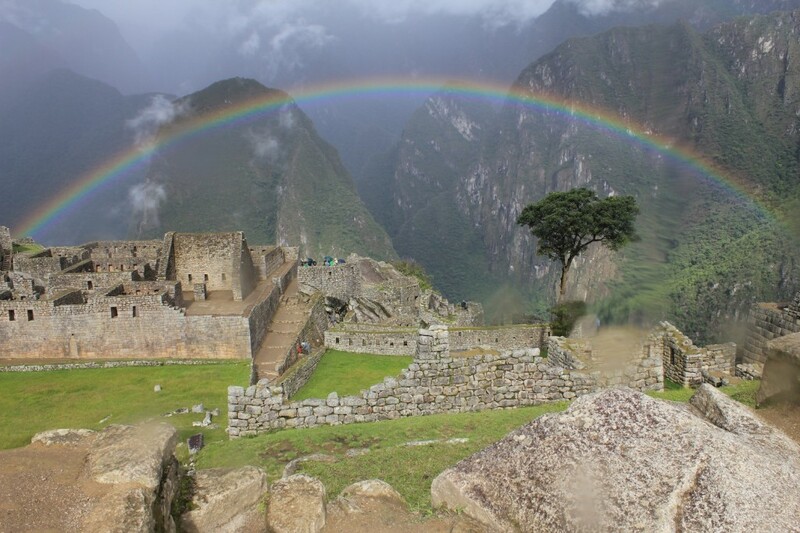 Surreal rainbow scene unveiled at Machu Picchu after a sudden rainshower, photo by Udi. 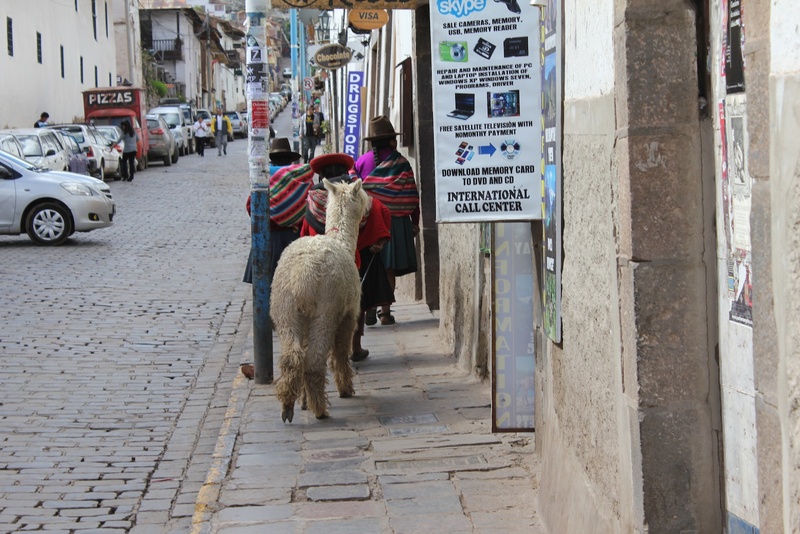 The Cusco bus station was chaotic. Although we were the only ones on the bus travel list just three days before, somehow the bus was now completely full. Waiting for our luggage to be placed on board beneath the bus, a young Quechua woman was trying to convince the bus driver that her enormous bag of grain should also be considered luggage. It was an all-night bus trip over the windy roads of the Andes Mountain range. We were to descend over 3,500 metres from the high altitude of Cusco to the lowlands of the Amazon where Puerto Maldonado lies. Thankfully, in spite of the questionable odours permeating the recycled air of the very crowded bus, we fell asleep quite soon. I awoke only once and was blessed with a view of ice and snow glittering in the moonlight as the bus wound its way higher and higher into the Andes over what I guessed was another summit. We reached Puerto Maldonado the next morning. Very early. Nearly 2 hours before we were meant to meet other guests also travelling to an eco-lodge we where we would be staying for three days, about 1 hour up the Tambopata River into the Amazon forest. Unlike the cold thin air of Cusco, Puerto Maldonado is lowland jungle. It was very hot and very humid. I have been fascinated by the Amazon rainforest since I was a child. I remember reading eagerly about the different animals, plants and people that populated this huge, vast region. I could never seem to acquire enough information. During my university years, I remember writing a paper in an environmental studies class about the debt-for-nature swap set-up (forgiving financial debt with the promise/exchange of preserving Amazonian forest). That we were passing through the Amazon, to get from Cusco in the Andes, to the lowlands of Peru and then into Acre, the southwest state in Brazil, seemed to me quite an obvious choice that we should spend a few days there to explore! This was in spite of the expense that was definitely over our very low-budget norm. I had looked into various options to stay. Over the past few years there seemed to be an explosion in the numbers of eco-lodges being constructed along the river. The best deal we found was at the Explorer’s Inn in the Tambopata Forest Reserve. It is one of the oldest eco-lodges in the area and one of only a few within the Tambopata reserve. There is also a sustainability ethic that permeates all aspects of the Inn. The boat ride to the Explorer’s Inn lasted about 90 minutes with a quick stop to have our passports stamped at a ranger station in Tambopata National Reserve. 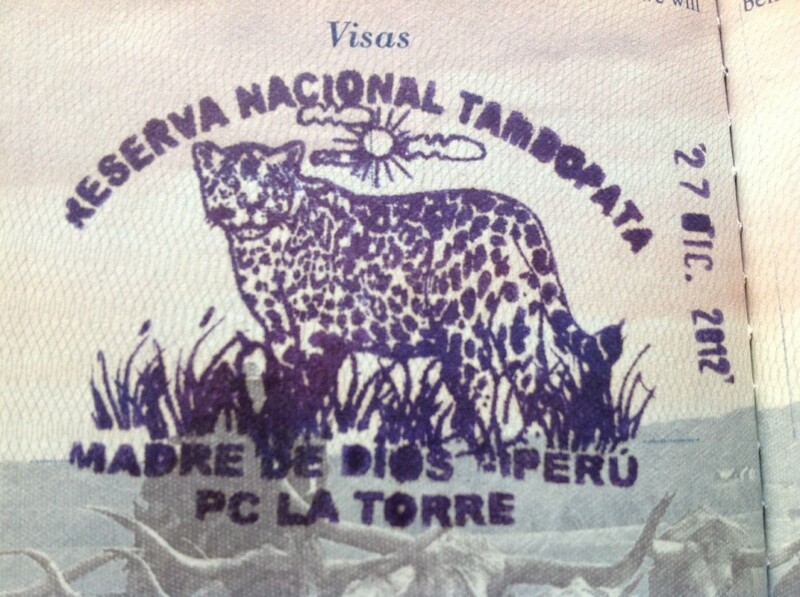 Tambopata Reserve passport stamp – definitely my first non-national visa! It turned out that the couple with us on the boat were also from the west coast of the USA – from Humboldt County, where the last stands of redwood trees still thrive in the thinly protected boundaries of Redwoods National Park. The Redwoods outside of the park are under constant threat of logging (similar to the Amazon). Arriving at the docking point for the Explorer’s Inn, we walked up the muddy hill and along the elevated wooden walkway into the main lodge. 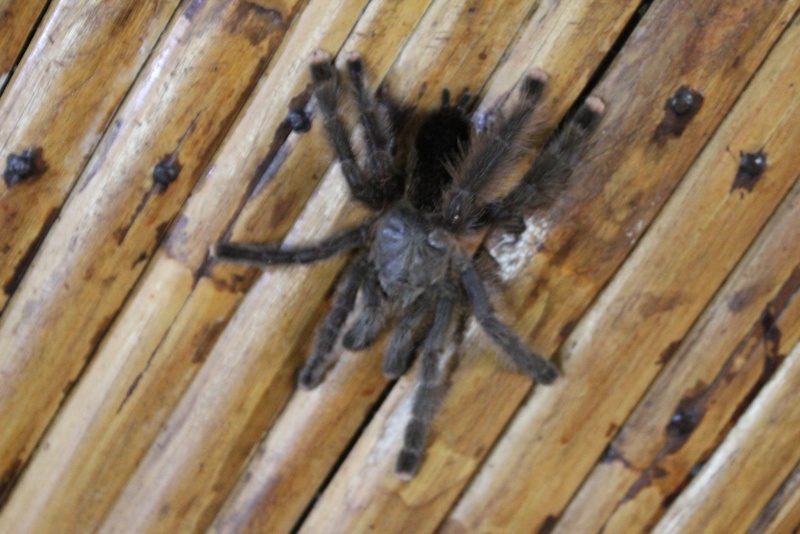 Inside, just at the bar area, we noticed a tarantula resting on one of the wine bottles. We were told it was the friendly bar tarantula. I had only ever seen a tarantula in a glass cage. 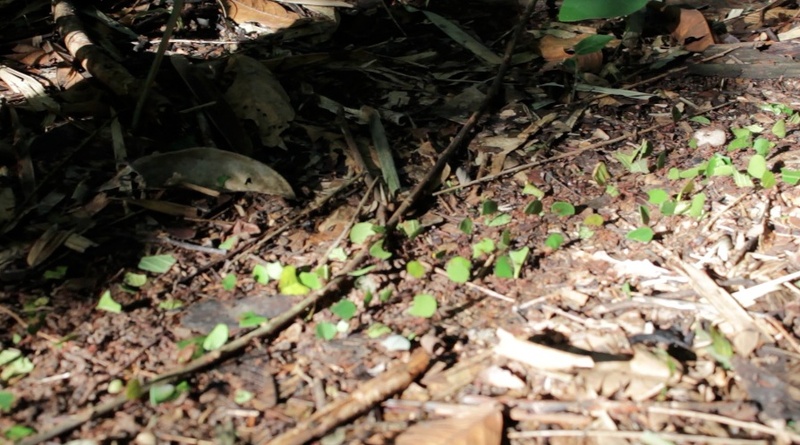 Alongside a night walk to identify nocturnal animals, a range of insects, plants and frogs; a trip to the macaw and parrot clay lick; an evening boat trip to locate any alligators on the edges of the river (we saw just a pair of eyes), there was also a 10km return walk through the forest to Cocococha oxbow lake to see about finding giant river otters, birds or any other mammals, such as the elusive jaguar. When we left toward Cocococha lake, it was lightly raining. There were six of us in total – the other couple from California, two guides and us. We were all wearing long rubber boots that were offered by the Inn. The walk was easy and flat, along a well-marked trail through thick forest. About an hour into our journey, however, the light rain became heavier and we were walking in water past our ankles. I kept trying not to think about the return journey. Our guide pointed out different tree and plant species along the way, describing different medicinal values. The bark of one tree in particular, is known to have properties helping to reduce the effects of malaria. I was the only one aside from him who volunteered to try it. The taste was strong and bitter. 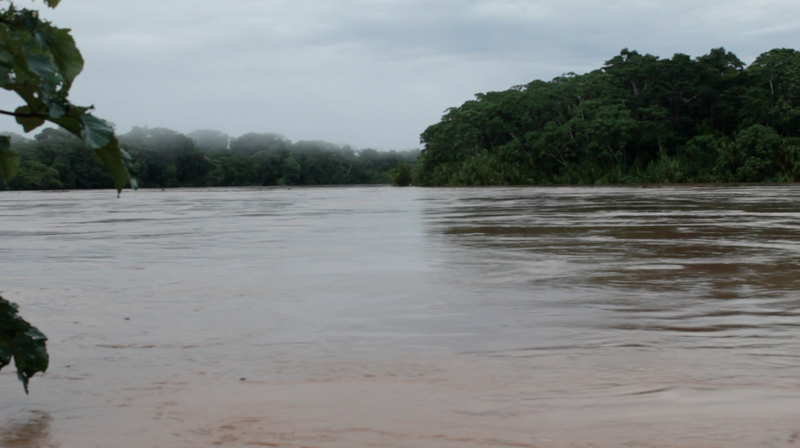 We arrived on the banks of Cocococha after a couple of hours. The rain was now in a steady pour. I had managed to keep my feet dry up to that point. The couple with us both had to empty out the water that had filled up some of their rubber boots. We were urged by both guides onto a boat – which was basically two canoes connected together by a plank in the middle. Three of us climbed onto each side – one guide per couple. The guides rowed at the back of each. We were told that the lake had a plentiful supply of piranha and anaconda. I tried to keep myself pre-occupied with the beauty of the edges of the lake – the trees, the unusual birds that kept coming into view – rather than focus on the rain that was gathering into small pools on the bottom of the boat(s) and consider what it might be like to be forced to take a swim. Suddenly I spotted a few heads surfacing the water about 200 metres or so in front of us. There were, in fact, more than a few. I counted 8. Unfortunately we did not bring our camera on the walk because of the rain. The photos of the giant otters below are from two different websites. The guides were also suddenly very excited, explaining to us that there was a family of 8 giant otters living at the edges of the lake. 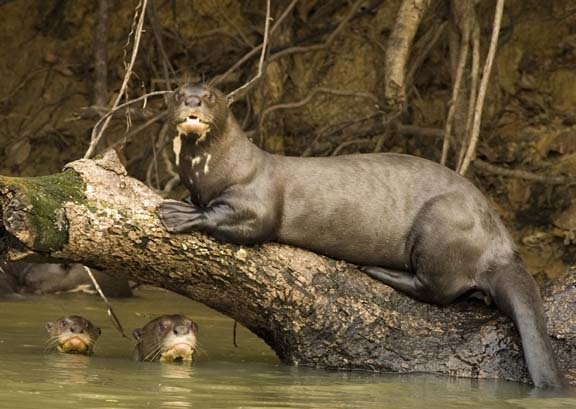 Giant river otters, or lobo de rio (river wolf) are endangered and it is apparently quite rare to see one, let alone 8! The guides told us that they had never seen the whole family together. Due to hunting, the population of giant otters dwindled down to less than 100 in the early 1970s. The population has risen steadily since then, but they are still considered endangered. As we approached, they otters came into view. In fact, they seemed to be heading toward us, swimming at an alarming rate. They were moving faster than the speed of our rowboat. All 8 of the giant river otter family were all advancing together toward us, extending their long distinctively patterned necks and making horrifyingly loud screeching noises. We were invading their territory and they were not very happy! 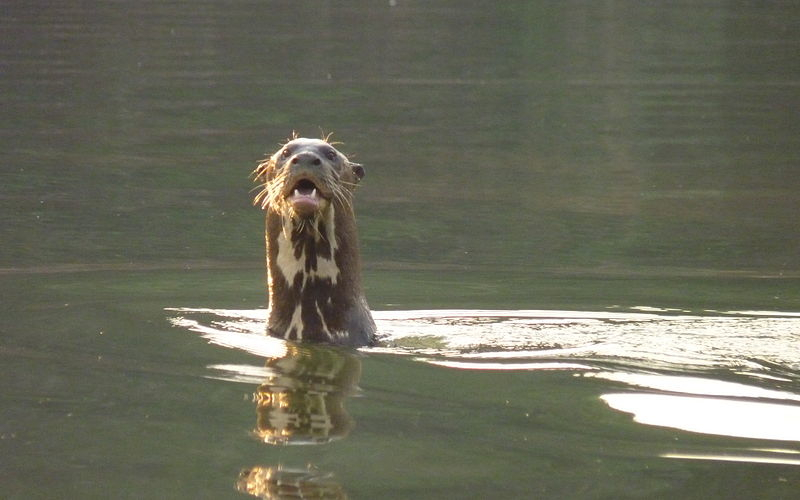 Giant river otters are around 2 metres long and are known to be aggressive when threatened. The guides began to turn the boats around. 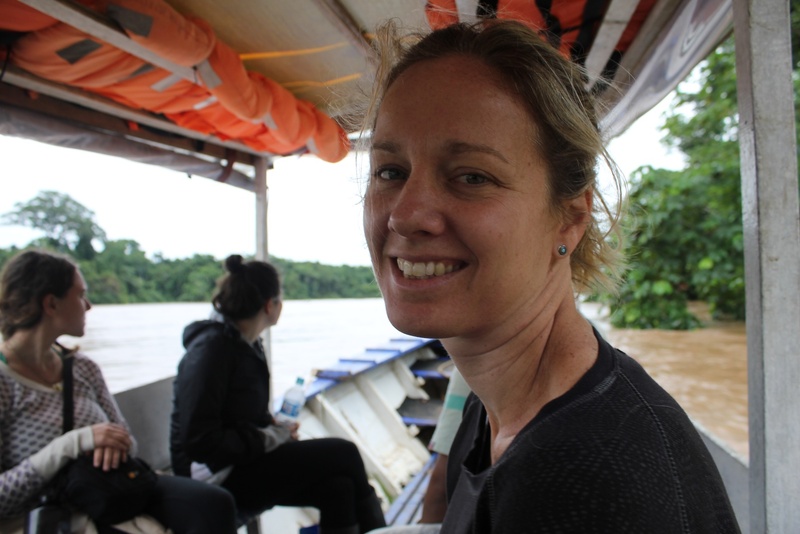 To say that I felt vulnerable sitting in pouring rain out on small boats that were filling up with rainwater on a lake with angry, screeching giant otters, piranhas and anaconda, is quite an understatement. We were relying on the strength and expertise of our guides who also appeared to be a bit shaken. The trail was a shallow river by the time we headed back. The water was nearly at our knees every step of the way. The guide in front of us was using his machete in front of him to warn off any creatures in the water. I kept wondering about the likelihood of snakes, but as luck would have it, we did not encounter any. As we tiredly walked into the lodge to return our boots, we were greeted by the encouraging shouts of the manager’s little girl who had told the kitchen staff about a pink python that had wrapped itself around one of the wooden beams holding up the main building of the lodge. The snake was beautiful and seemed very happy just to be hanging out. I kept wondering what it must be like to be a child and grow up in such an area – to learn about the forest’s secrets and vast knowledges embedded within the soul of each living being. And also to look at the many tourists coming in and out of the doors of such a place with continuous curiosity. 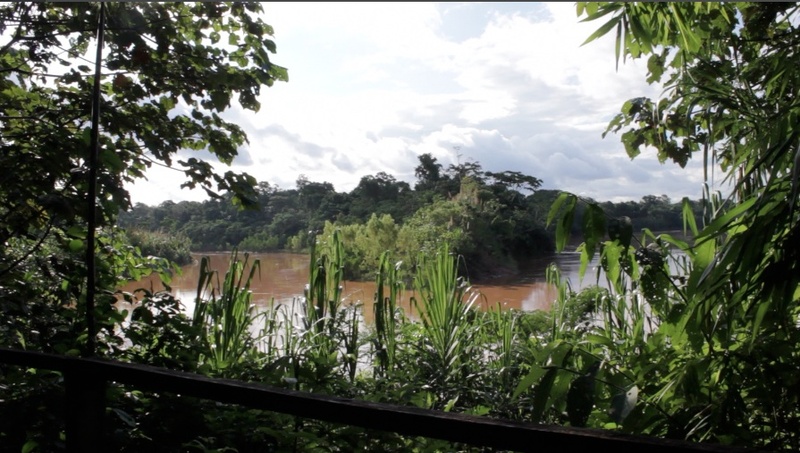 The Tambopata area surrounding the Explorer’s Inn is a nearly 1.5 million hectare rainforest preserve that is firmly protected from being cut. In areas where the Amazon forest is not firmly protected legally through some form of legal regulation, it faces serious threats from ranchers, loggers, farmers, etc. 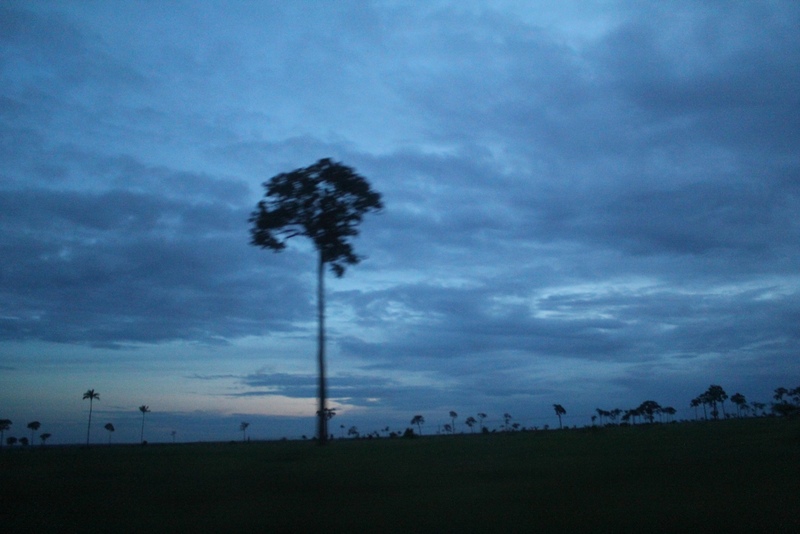 As we drove along the highway from Puerto Maldonado toward the border of Brazil, the views looked uncannily familiar. This was in spite of the fact that I had never been to this part of the world before. I remember as a teenager and young adult feeling an intense sadness seeing photographs and films of sections of the Amazon forest being clearcut with the primary purpose of converting the land for cattle-grazing. Its aftermath appeared as an eerie open space with intermittent canopy trees left to listlessly stand and provide thin areas of shade for the overheating cattle. The road we drove on was only just recently paved. For at least 50 kilometers on either side of the highway was grazing land. I noticed the intermittent canopy trees and felt the exact feeling I had felt 20 years earlier. It was a feeling of mourning and loss. 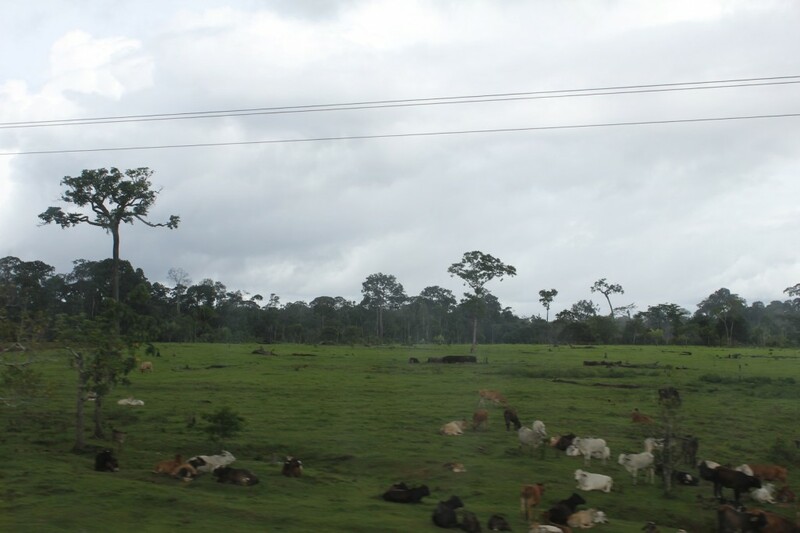 Udi reminded me that beyond these 50 kilometers there were vast areas of protected forest. 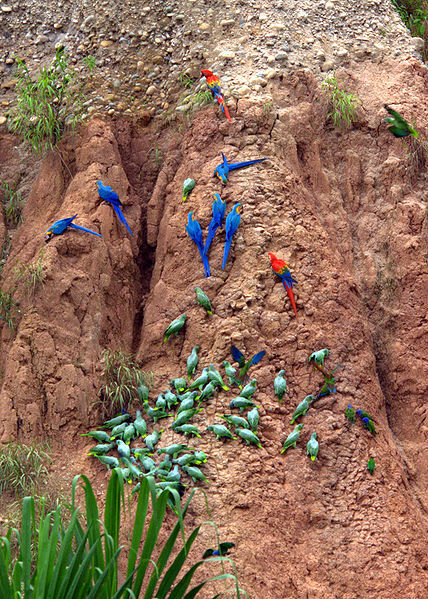 The Amazon is under continual threat from different types of intrusive development – logging, mining, ranching, dam construction…The pressure and threat of deforestation will not end anytime soon. Ceremonies can be somber or festive. They can mark the passage of time, celebrate people, places, significant events in the life of individuals or historical episodes. As Judy Atkinson, a wise Aboriginal scholar has written in her wonderfully engaging book, Trauma Trails: Recreating Songlines, the purpose of ceremony is “uniting hearts and establishing order”. Ceremonies may also involve, often quite subtly, the transformation of the person, initiating them into new cycles, perspectives, connections. On a larger scale this may also mean the transformation of communities. The relationship between ceremony and community has been especially visible in places where ceremonies were banned through colonial occupation and religious intolerance. For the Blackfoot, prohibited to leave the boundaries of the reservations ascribed to them on their own territory, they were banned from visiting their own sacred sites and holding ceremony for more than a century. 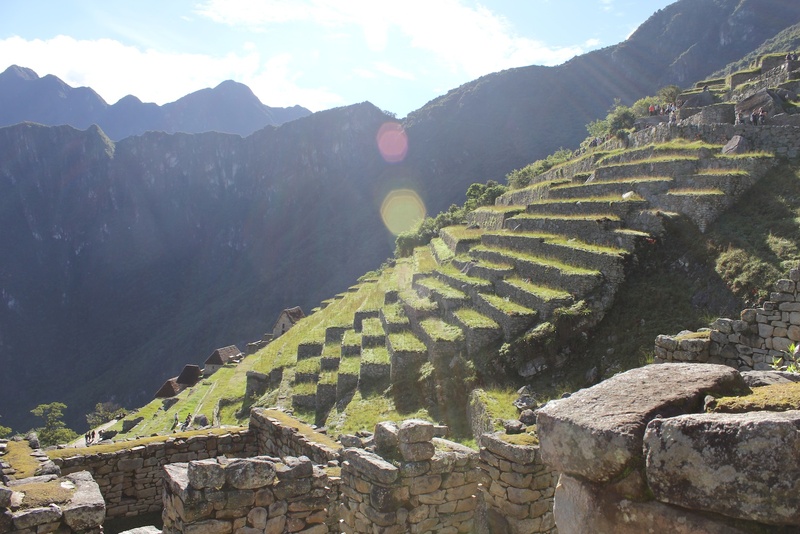 For the Quechua, it is only during the last few years that ceremonies are once again allowed to be held in the places created by their ancestors, used freely hundreds of years ago for this purpose of connecting to place and to the cycles of the earth, moon and sun. Within each place we have visited so far along this journey, we have listened to the importance of ceremony of past and present. We have also experienced and participated in many ceremonies that have enabled our bodies (hearts and minds) to become more fully immersed in the places we are visiting, to connect more deeply with the people we are meeting and the land beneath our feet. We had not expected that ceremonies would be such an important ingredient in enlivened learning and in transforming identities. We want to explore this dimension of ceremony over subsequent posts. 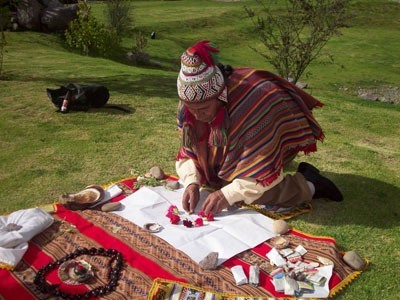 As a way of beginning, this post describes a ceremony in Cusco, Peru. 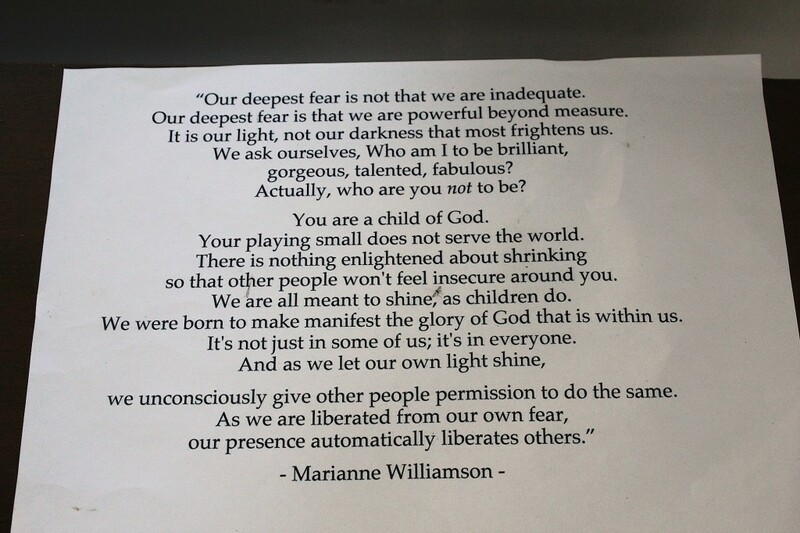 We write this through both of our experiences. Each of us have unique experiences of the same event. The significance of ceremony is collectively yet uniquely felt, bringing us closer to each other and also to each of ourselves. The pictures in this posting are not our own. They are from other sources on the internet as indicated on each photo. We did not bring our camera into the ceremony. The experience, rather is imprinted quite strongly in our minds and hearts. 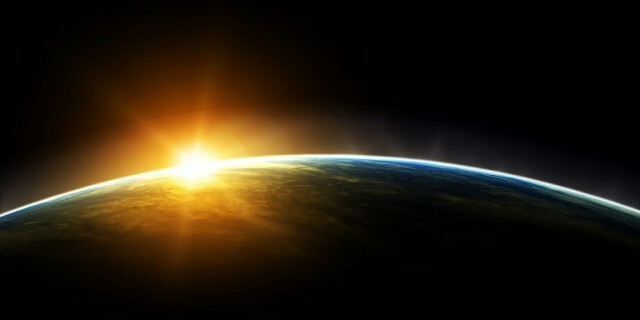 It is the 20th of December, the day before the Southern Hemisphere’s Summer Solstice, the longest day of the year here. 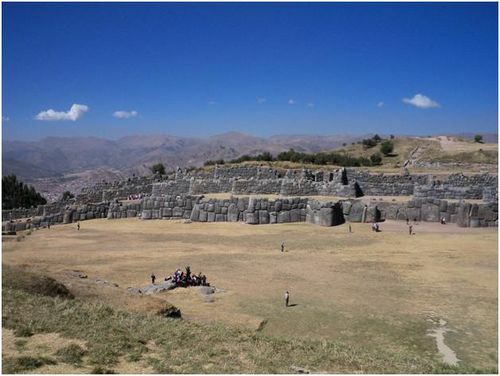 We walk up the winding path from the edges of Cusco towards the temples of Saqsaywaman on the steep hills above the city. Our steps are dimly lit by the overcast night sky. We see no one along the way until we meet a family of four, waiting to by the edge of the site of the ruins equipped with bags of offerings and blankets. We introduce ourselves and they invite us to join them as they make their way into the site. We were invited here by Elena Pardo, the Quechua education activist from CEPROSI, one of the smaller organizations associated with Pratec. In our conversation she mentioned other activities she is involved in beside her work on the rejuvenation of Quechua culture in the education system. This entails working with a number of Quechua groups and organizations to revive Quechua ceremonies related to the Quechua Calendar and in the places that were important to these communities. 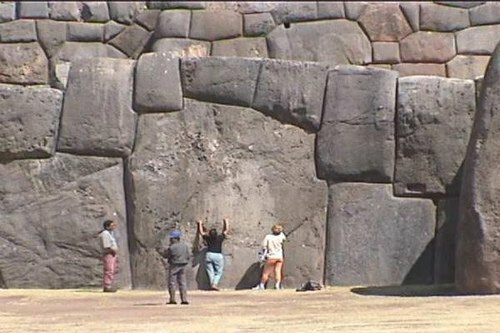 Saqsaywaman was such a site in Incan times and we are here to join others in greeting the new cycle of the sun. We arrive with the family in a natural grassy amphitheater and walk around a semicircle of some thirty Quechua persons clad in colorful ponchos and hats. The group faces East and on the ground are blankets covered with offerings of drink, foods, leaves and incense. Our sense of foreignness is soon dissipated as we are warmly greeted. The night grew colder and sitting on plastic sheets we were offered blankets. Over the course of the next few hours we sang, instruments were played and we walked around the ruins in a line with the masters of ceremony offering incantations at various points around the site. Unable to resist the cold and damp of the evening we retired to bed promising to return in a few hours before the sun came up. 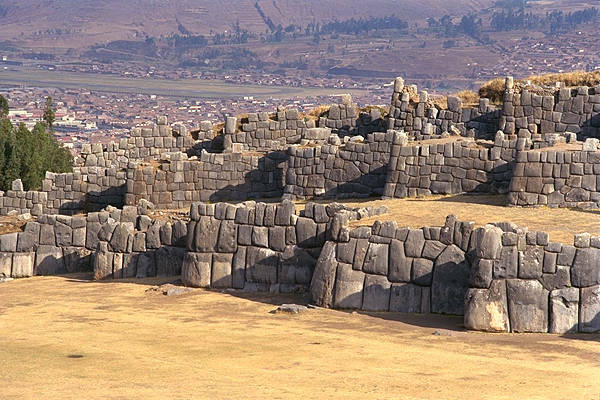 I feel apprehension climbing the steep path leading up to the ruins of Saqsaywaman. I am not clear if the tenseness I feel through my body, particularly the bottom of my stomach, is due to us sneaking onto the site after hours, the possibility of us encountering a gang of thieves as we had been warned, meeting a group of people for the first time during a spiritual ceremony and/or the lack of certainty I feel about whether we were genuinely invited (I could not communicate directly with Elena due to language constraints). Perhaps it is a combination of all of these. The path climbs more and more steeply. The dim light blurs the sharp edges of the stones placed beneath our feet. 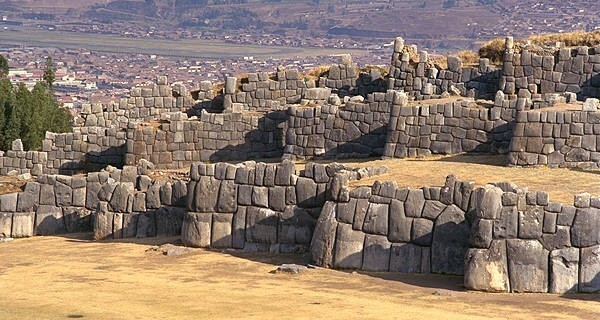 Suddenly, on our left, mammoth stones come into view, in the shape of high walls. I stop to admire the beauty in their carefully planned (at the time), yet not fully understood irregularity. 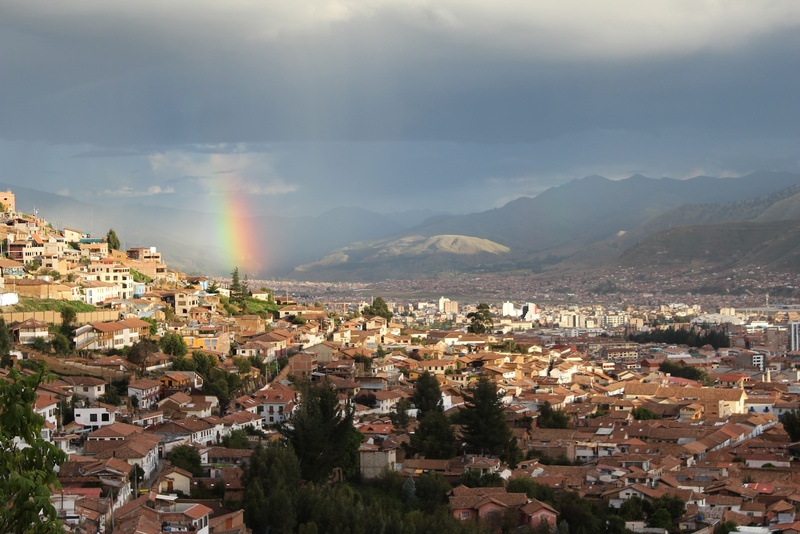 Peru, especially Cusco, has experienced many earthquakes over the past several hundred years. These stones, many of which are at leas twice my height and width have remained intact through all earthquakes. There is nothing gluing them together. They rest together like a perfectly fit glove. The moonlight and the dim electric lights create a glow around the interlocking giant stones. I am in awe. It is my first time into these ruins. My anxiety lessens. I feel a gathering resolve amidst the excitement to be attending a ceremony in such a spiritual place. My nervousness drifts into the thinning clouds resting in the silvery moonlit sky. Udi gently reminds me of time and we walk further. The path flattens and we encounter a group of 4 people closely gathered. They are all female – one child and three adults. They are awaiting further notice as to the exact site of the ceremony. Many minutes later a call comes. We are invited to follow them into the centre of Saqsaywaman, one of the most spiritual sites of the Incas before us and for the Quechua with us. Walking through tall boulders at first, the view from inside Saqsaywaman becomes more visible as we enter a large empty field-like area. There are chanting sounds, many people are dressed in ponchos and woven hats. I notice many people are barefoot in spite of the cold. There is a blanket with dried flowers, candles, a couple of large shells and other objects spread across the blanket. One of the large shells is picked up and blown. We are beckoned to come and sit closely to the four women we followed in. They hand us an extra blanket for us to keep warm. I notice we are the only non-Quechua people present, but I feel a strong feeling of inclusiveness amongst all of there together, as human beings, rather than as separate identities. We walk in a circle several times around the blanket as a large drum beats, keeping our pace. The elder man beating the drum is also carrying the drum. We stop and form a semi-circle around the blanket. An elder Quechua women deliberately approaches each person, waving feathers and slowly blowing incense smoke on each of down our bodies and chanting spiritual wishes. I feel an incredible rush of warmth and strength as she stops briefly in front of me. We got up at 4am after a couple of hours of sleep and made our way up the hill again. Dawn was starting to break over the surrounding hills of Cusco. Reaching the site again the semicircle had doubled in numbers and we were no longer the only non-Quechua. 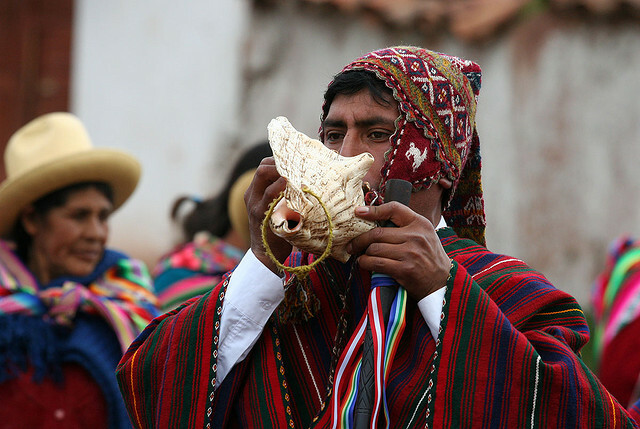 After more music and incantations people were invited to offer their prayers to the rising sun Inti and to the earth Pachamama – both sources of life. Some spoke and expressed their gratitude in Quechua others in Spanish, offering libations of drink to the earth and to a small fire lit in a clay pot. The ceremony was concluded with every member of the group hugging everyone else and wishing them well. The master of ceremony, a Quechua Elder, also expressed his gratitude for everyone being there including the non-Quechua, reaffirming our common humanity and the importance of working together to bring renewed spiritual life to the earth in these times of crisis. As we later hugged he addressed me as ‘little brother’. We walked down the hill with Cusco looming larger with each and our hearts reconnected to something larger than ourselves, and to others, brothers and sisters from these Andean mountains also wanting a better world where we live in more harmony between ourselves and with the web of life that sustains us. Photo taken in 2011 at the International WINHEC (World Indigenous Nations Higher Education Consortium) Education gathering. 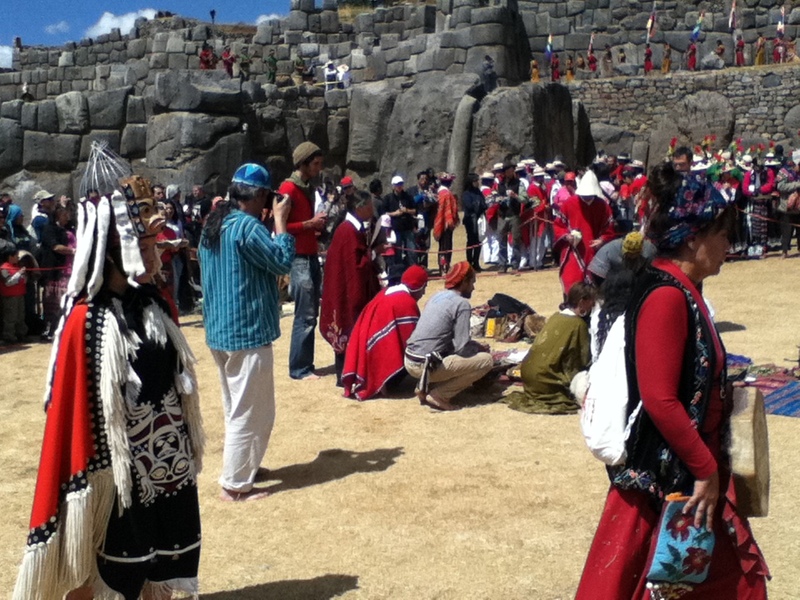 An international ceremony took place at Saqsaywaman to celebrate the occasion with indigenous (and non-indigenous) peoples from all over the world. I awaken startled, my heart racing from the shock of the alarm we had set just three hours earlier. Udi and I want to return to the blanket and circle, to join the ceremony once again, up at Saqsaywaman, before the rays of the sun become too pronounced over the horizon. Ev and Pepe join us – the four of us venture back up the steep path to Saqsaywaman. The haze and rhythm of the last couple of hours during which we were walking around the ruins together, was running through my mind like a slow motion film. After a few hours sitting and walking around the blanket, two of the elder men had started playing Quechua flutes and we formed a sort of queue with each of them at either end, all of us between them. We had walked in silence, with the exclusion of flutes and a drum leading us around the ruins, stopping us at different points to offer prayers of gratitude to ancestors and Pachamama. As the first rays of sunlight hit the huge Inca stones that morning, we step into the open center of the ruins where we had first followed the four women to, 9 hours earlier. It was around 5am. This time, there are at least 50 people – possibly twice as many people as we had first encountered. Many non-Quechua people had joined the original group. Everyone is facing us and I feel a bit shy, hoping we are not interrupting too much. As we move closer, we are welcomed with warm smiles and motioned to join the far right side of the semi-circle. One of the Elder Quechua men I recognise from the evening before walks to a small fire that has been lit in front of the blanket. I can now see the colours of the clothing, the blanket, visibly. He is wearing one of those hats that have a tail on top with an explosion of the bright colours that are woven beneath the exquisite beading that covers the hat. He is still barefoot. This is particularly noticeable with his trousers reaching just past his knees. One of the elder Quechua women, I assume the same woman who had given each of us blessings the night before, joins him at the fire. They put incense as offering on the fire and toward toward the sun’s rays welcoming the new day, the Solstice.